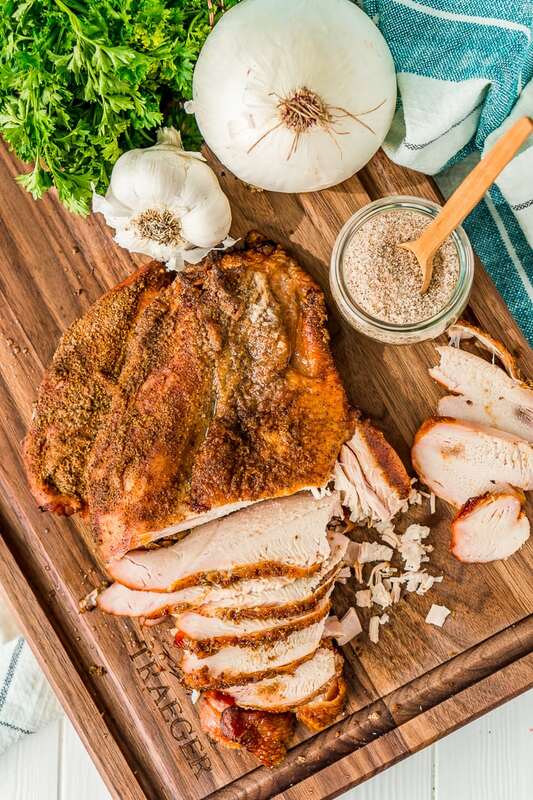 This Smoked Turkey Breast is made with a warm and spicy dry rub that adds tons of flavor to the tender and juicy meat. Thanksgiving is just a couple of days away and if you’re looking for an alternative to the traditional oven roasted turkey, this Smoked Turkey Breast is the answer! 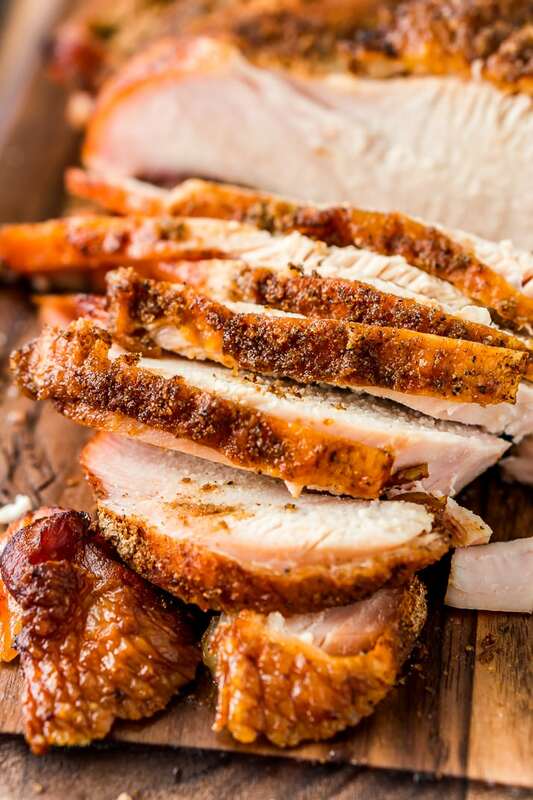 This smoked turkey breast is flavored with a homemade spice rub made with sweet paprika, cinnamon, turmeric, and more. The blend of spices will tantalize your taste buds far beyond a traditional turkey dinner! JUST TAKE ME TO THE SMOKED TURKEY BREAST RECIPE ALREADY! 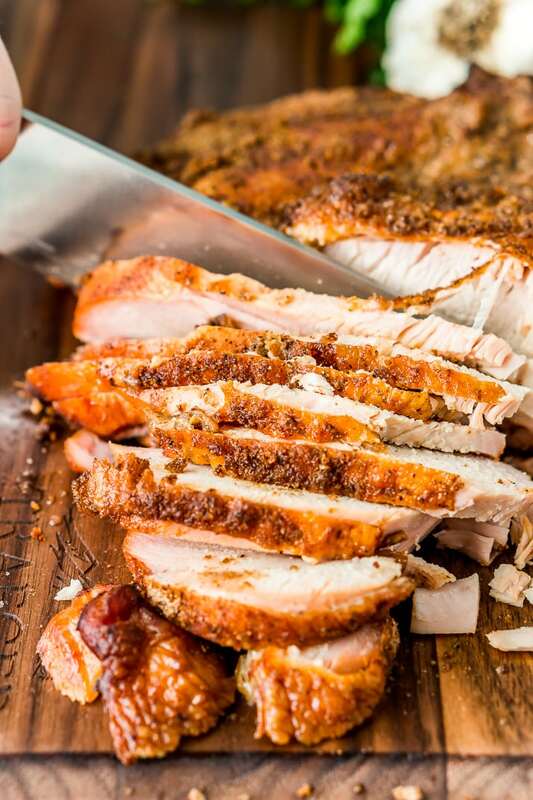 If you’d rather skip my (very helpful, I think) tips and tricks, essential cooking info, and similar recipe ideas – and get straight to this deliciously easy Best Ever SMOKED TURKEY BREAST Recipe – simply scroll to the bottom of the page where you can find the printable recipe card. I use my Traeger 22 Pro Series for smoking and love the consistency and ease it provides for smoking meat in the city. Traeger has a ton of wood pellet flavors, but my favorite to use for this recipe is the Pecan, they provide an extra level of warm sweet flavor to the meat. How Long Will It Take To Smoke A Turkey Breast? Turkey takes about 20 to 25 minutes per pound when smoking at 325 degrees F. For this particular recipe which calls for a 4 to 5lb turkey breast, you can expect it to take about 1 hour and 45 minutes to 2 hours and 30 minutes to cook. What Temperature Should Turkey Be Done At? Just like chicken, the turkey should reach until internal temperature of 165 degrees F when it’s done. Smoking can add so much color, tenderness, and flavor to meats and it’s one of my favorite ways to cook. With poultry, I still like to brine my meat before smoking to make it extra juicy. 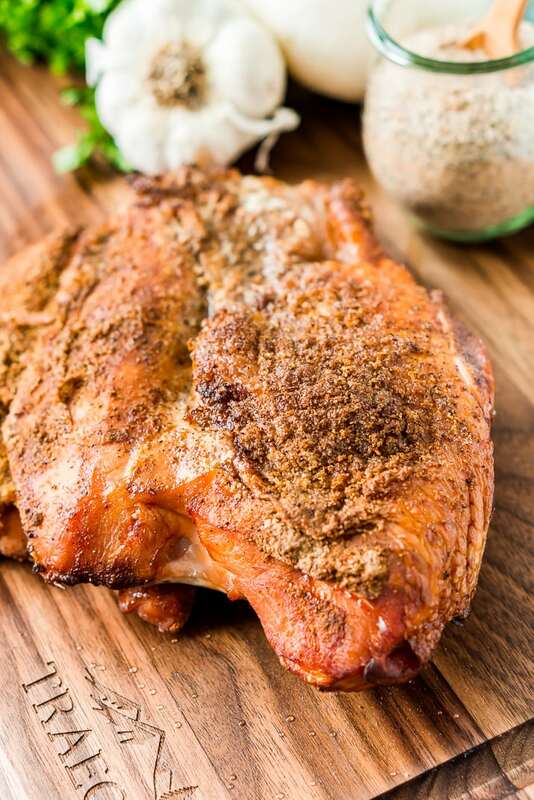 I recommend using my Turkey Brine or your favorite brine for this smoked turkey breast recipe. You’ll want to brine the turkey overnight and then drain and rinse the turkey and pat it dry with a paper towel. Set the temperature of your smoker to 325 degrees F and preheat for at least 15 minutes with the lid closed. Then you’ll finish preparing your turkey by rubbing the softened butter under the skin of the turkey. Next, you’ll combine the spices together in a small bowl and rub all over the turkey breast. Then place the prepared turkey breast on a foil-lined roasting pan with a rack. Cook the turkey breast until it reaches an internal temperature of 165 degrees F, usually 1.5 to 2.5 hours. If the breast starts to get too dark, cover it with foil. This Smoked Turkey Breast tastes amazing paired with my Bourbon Orange Cranberry Sauce. And don’t forget the Thanksgiving Punch and Corn Casserole either! Brine the turkey overnight and then drain and rinse the turkey and pat it dry with a paper towel. Rub the softened butter under the skin of the turkey. Combine the spices together in a small bowl and rub all over the turkey breast. Set the temperature of your smoker to 325 degrees F and preheat for at least 15 minutes. Cook the turkey breast until it reaches an internal temperature of 165 degrees F, this usually takes 1.5 to 2.5 hours. 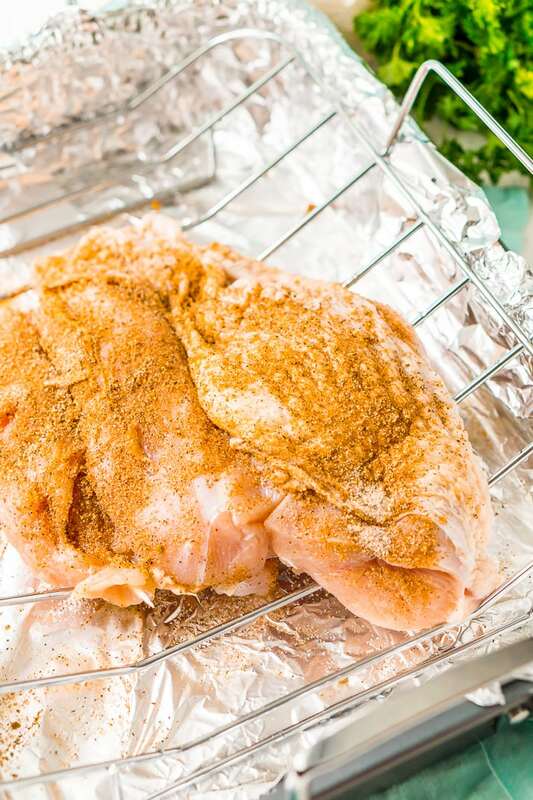 If the breast starts to get too dark, cover it with foil. This recipe calls for a 4 to 5lbs turkey breast, anything larger will require more time and may require additional rub.